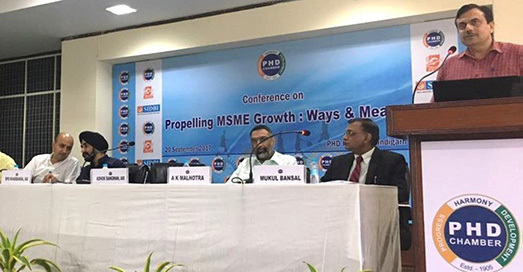 Since, the Micro, Small and Medium Enterprises (MSME) sector has emerged as a highly vibrant and dynamic sector of the Indian economy over the last five decades, CMA fraternity attended the conference on “Propelling MSME Growth: Ways & Means” on 20th September 2017 at PHD Chambers. The conference focused on tremendous potential and growth in recent times and also the challenges to MSMEs like absence of adequate and timely banking finance, limited capital and knowledge, non-availability of suitable technology, low production capacity, ineffective marketing strategy, global accessibility, constraints on modernization & expansions, non- availability of highly skilled labour at affordable cost. It was also shared that this sector consists of 36 million units, as of today, which is providing employment to over 80 million persons.